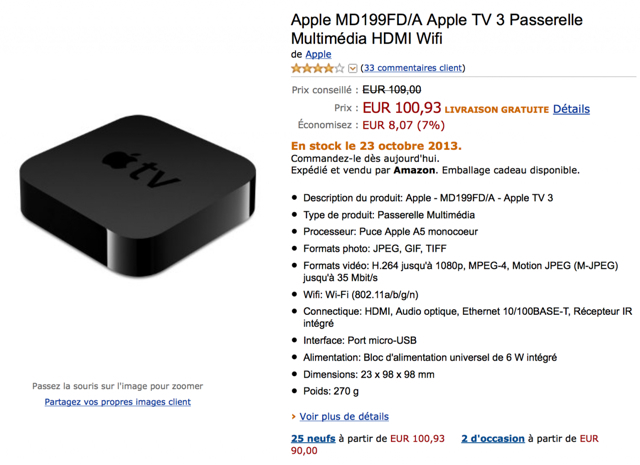 Amazon Germany and Amazon France are both listing the availability date for the Apple TV as October 23rd, just one day after Apple's special event, hinting that a hardware refresh could be coming. That would corroborate a report from MG Siegler, a venture capitalist and writer for TechCrunch, who predicted new Apple TV hardware this month. Apple's event on October 22nd is thought to focus primarily on the release of a new iPad 5 and iPad mini 2 with Retina Display; however, Apple could also release OS X Mavericks, update the MacBook Pros, and launch its already unveiled Mac Pro. With the theme of the event being, "We Still Have a Lot to Cover", it's possible that the company will update the Apple TV as well.